The Black Hole Engine. Note the black hole diagram to the left. The event horizon is the point of no escape. It is a theoretical mathematical sphere of zero width because in real black holes there is nothing there to see. It would be like entering a maximum speeding zone in a car, there is no hard boundary. But in this case, there is no way to turn back. The "singularity" is at the center of the black hole where all inside materials head towards and whose density and gravity approaches infinitely. The appearance of a singularity in General Relativity indicates the limit of this theory. It illustrates places and/or conditions where the theory breaks down and one can not know the details of exactly what is happening. All "rotating" black holes pull along a region of spacetime with it due to a phenomenon called Frame Dragging. General Relativity predicts that a fast rotating object will drag any nearby object along with it. The region where it is not possible for an object to remain stationary is called the "ergosphere". Its shape is that of an oblate spheroid - bulging at the equator, and flattened at the poles of the rotating black hole. Since the ergosphere is outside the event horizon, it's possible for an object within it to escape the black hole. When it does, it will leave with extra energy accumulated from the spinning black hole. Not all scientists believe that the ergosphere is real, it may be just a mathematical entity. 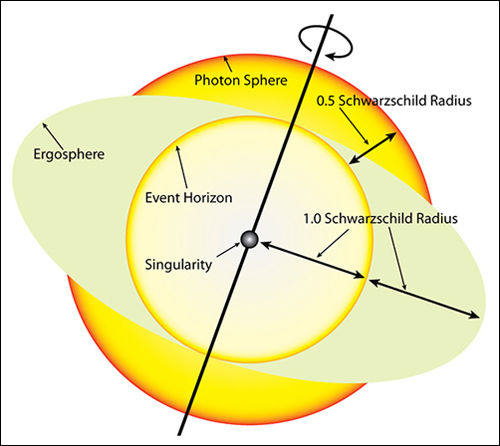 The red ring above labeled the photon sphere is also called the photon ring. The photon sphere is also called the innermost stable circular orbit (ISCO). This is another mathematical theoretical boundary. As the gas and other material in the accretion disk spin closer and closer to the black hole, they travel faster and faster approaching the speed of light. The photon sphere is the point where only light photons can can travel fast enough at the full speed of light to continuously orbit the black hole. Again, this is a theoretical radius equal to one and a half times the event horizon radius - the Schwarzschild Radius. In real life even photons would have a tough time orbiting the ISCO for any length of time because they would eventually collide with another photon and either travel off into the future or fall into the event horizon and be lost. Therefore the photon sphere is in real life an unstable reference point. However it is very useful for mathematical calculations of the innermost ring of the accretion disk. The important take away here is that there is "space" between the black hole and the accretion disk which we shall discuss further below. See Inner Edge Accretion Spacing. Model Of A Supermassive Black Hole. Plasma gas (electrons and protons), falling very close to a black hole, orbits it and accumulates into a flattened Accretion Disk. The gas in the disk spirals inward, becoming compressed and heated as it nears the center. Ultimately reaching temperatures up to 20 million degrees Fahrenheit (12 million C), the gas shines brightly in low-energy "soft" x-rays. Over 40 years, observations show that black holes also produce "hard" x-rays with energy tens to hundreds of times greater than the soft x-rays. This implies the presence of a much hotter gas above and below the disk, the Corona, with temperatures reaching billions of degrees. The Corona is believed to be the source of the "hard" x-rays and gamma rays. This very hot gas is a phenomenon similar to the hot corona that surrounds our sun. Keep in mind though, a Corona has never been directly detected and we have no real knowledge of what a Corona is shaped like or what its composition is. Most scientists believe Coronas are real because of the "hard" x-rays and gamma rays that are somehow being generated. Many astro-physicists think the Corona is the source of jets, but at this point it is speculation. Only about 10% of black holes have jets. Around the edge of a super-massive black hole there is a huge ring of very dusty gas called a "Torus". The Torus is very dense and lumpy. If one is looking at a black hole edge-wise, all you can see is the Torus as it is so large it blocks the view of the actual black hole. One has to be located on quite an angle to see over the Torus to witness the black hole itself. See the NASA artists' rendition of NGC 1068 to the left below as a result of NuSTAR, the very high x-ray/gamma ray satellite, taking very detailed images of the NGC 1068 Torus. The Torus prevents many black holes from being seen from earth as they are edge on to us. However, they can still be detected by x-rays. 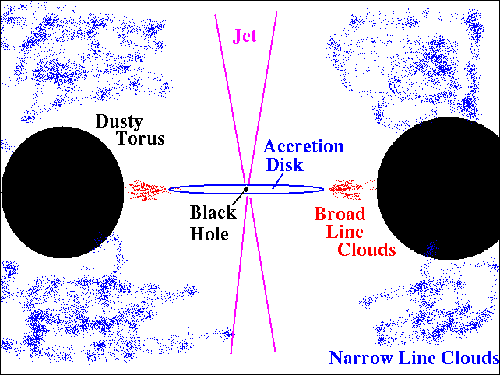 Between the Torus and the Accretion Disk lies a region called the Broad Line Region (BLR). It consists of clouds of swirling gases that are not part of the Accretion Disk, but are dense enough to radiate broad optical emission lines. These come from cold material close to the Accretion Disk. The lines are broad because the emitting material is revolving around the black hole with high speeds causing a range of Doppler shifts of the emitted photons. Outside of the Torus there exists more cold swirling dust clouds. This area is called the Narrow Line Region (NLR) because they emit narrow optical lines. Black holes essentially start out as spheres of mass with strong gravitational pulls. As gas, stars and other material fall into them, black holes absorb not just the mass of the objects but also their magnetic fields. Black holes become more and more magnetically charged as time goes on because the angular momentum of incoming material must be preserved. When a black hole has acquired a very strong magnetic field, the black hole's spin will warp space-time around it (see the image at the left), causing the magnetic field lines to twist into spirals along the black hole's axis of rotation. The NASA chart to the left illustrates the basic model for determining the spin rates of black holes. 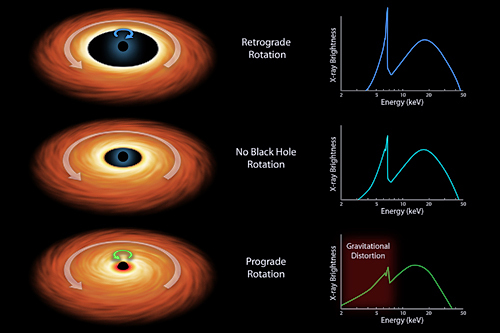 The three artist's images represent the different types of black hole spin: retrograde rotation at the top of the chart, where the accretion disk moves in the opposite direction of the black hole; no spin in the middle of the chart; and prograde rotation at the bottom of the chart, where the accretion disk spins in the same direction as the black hole. Note that for the retrograde rotation (opposite spins), the edge of the accretion disk is a considerable distance from the black hole. Also note in the blue x-ray chart to the right there is an absence of x-ray energy at the lower energy levels. In the case of a prograde rotation (both spin in the same direction), the edge of the accretion disk is very close to the event horizon. The green energy chart to the right shows positive values for the low energy levels and also that they are somewhat distorted compared to the no rotation light blue graph in the middle. The x-rays in this case are so close to the event horizon that the strong gravity from the black hole distorts the x-rays according to Einstein's theory of Relativity. Physicists still do not know in detail "exactly" how black hole jets are formed. 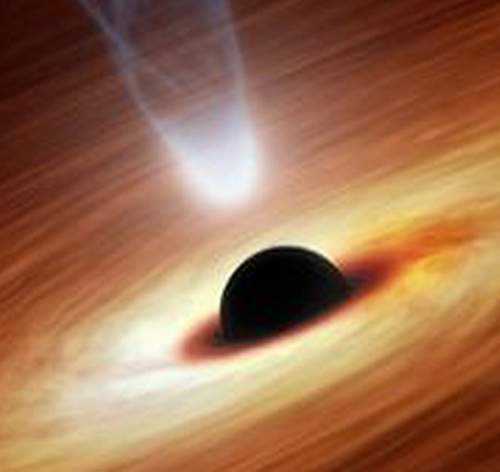 Astro-physicists believe the power source for black hole jets comes from the accretion disc, not the black hole itself. "Real" black holes with jets are a far cry from simplistic mathematical formulations. The big differences between the original simplistic mathematical equations and the real universe are the magnetic fields that are ignored in the simple math formulations (which do not incorporate accretion disks and jets). Recent black hole computer models do incorporate jets and are being constantly revised as scientists better understand black holes and their jets. The jet formation "hypothesis" is that the plasma gas and dust which forms the accretion disk is made up of protons, electrons and radiation at extremely high temperatures - several million degrees C. These elements are in a wild state, spinning and traveling close to the speed of light roughly in synch with the spinning black hole because of Frame Dragging. These spinning particles also have associated magnetic fields spinning along with them. The spinning magnetic fields collimate into humongous rising columns which propagate some of the plasma from the accretion disks into huge jets with terrific outward force and speed. The jets of plasma line up with the rotating axis of the black hole and emerge from each face of the disk. What Do We Know About Black Hole Coronas? Note the white section at the bottom of the jet in the illustration above left, this is the black hole corona. Scientists associate the corona of a black hole to be something like the corona around the sun. The formulation and make up of the black hole corona is not understood very well. Compact regions above and below black holes contain sources of super hot high energy x-ray radiation and could possibly be the sources of black hole jets. In addition to its own light, the Corona lights up the accretion disk, which then reflects it, making the accretion disk an additional source of x-rays. See the illustration to the left. Observations have shown that black holes produce "hard" x-rays, with energy tens to hundreds of times greater than the "soft" x-rays normally produced by the accretion disk. This implies the presence of a much hotter gas, with temperatures reaching billions of degrees - hence the corona. Astronomers at NASA, Johns Hopkins University and the Rochester Institute of Technology have recently (June, 2013) completed a supercomputer simulation of a "non-spinning" black hole and confirmed that stellar-mass black holes due produce a corona. The researchers are currently expanding the simulation to "prograde" spinning black holes, where the rotation pulls the inner edge of the accretion disk further inward and conditions become even more extreme. To the left below is a plot of how bright the black hole Cyg X-1 is in x-rays. The vertical axis is brightness and the horizontal axis is the energy of the x-rays. The round black points labeled "X-ray data" represent how bright Cyg X-1 measured at each frequency of x-ray. It is the brightest around 2 keV and has emissions all the way up to 100 keV. The solid line line, a curve with a hump-like shape, is the result of mathematical modeling. Mathematical models are based on the size, composition and temperature of the accretion disk plus the mass of the black hole. Depending on how hot the disk is, astronomers can estimate how bright its accretion disk will be at different frequencies. When the components of the model are summed up, they make up a curve that can be compared to the original data. The model result of Cyg X-1 is the solid black line and lies approximately on top of the real data - an exceptionally good fit. The final model is made up of three parts. The light the accretion disk emits is shown by the long-dash line (and labeled in blue). There is also a corona, and much like the corona of our sun, it is a region of hot gas that is much less dense than the accretion disk, but emits very powerful "hard" x-rays. The light the corona emits is shown with the short-dash line (labeled in red). Note that the corona has very strong x-rays all the way up to and beyond 100 keV. 100 keV is the beginning range of gamma rays. The third component is the light the accretion disk reflects from the corona, its emission is shown with the dotted line (labeled in green). Why is the green reflection line so complicated ? This complex dotted line is a result of all the different kinds of materials that are rotating in the accretion disk. 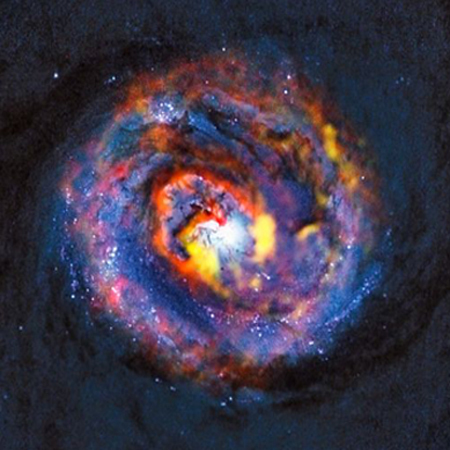 A black hole in the heart of distant galaxy NGC 1097 (pictured to the left) has a mass of 140 million suns. 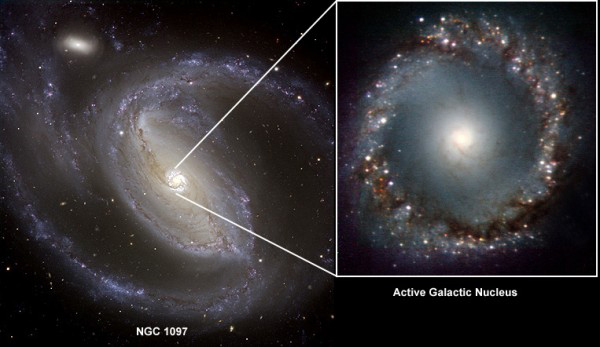 Galaxy NGC 1097 is 47 million light years away from earth, too far to determine the mass of its central black hole by the circulation of the stars around it. A new way of estimating the mass of distant black holes was needed. By tracking the movements of two types of molecular gases around the galaxy's center, researchers using the Atacama Large Millimeter Array (ALMA) in Chile were able to work backwards and determine the black hole's gravitational pull and its mass. The results show that this black hole is significantly larger than the one at the center of the Milky Way, i.e. 140 million suns in mass versus the Milky Way's 4 million suns. The ALMA telescopes tracked the radiation emitted from the two gases, hydrogen cyanide and formyl cation, as they swirled around the galaxy center. The gases don't interact strongly with local conditions within the galaxy, such as ionized gases flowing inward or outward. This means the movements of the gases paint an accurate picture of the effects of the black hole's gravity pull only. 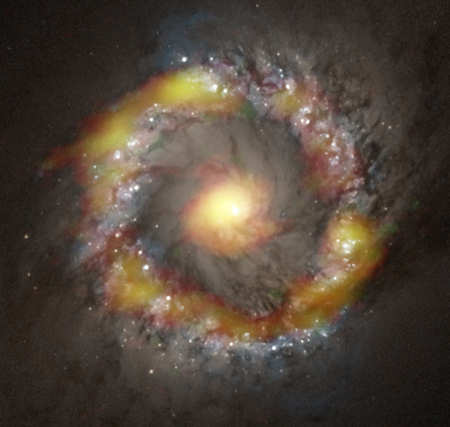 Pictured to the left is the distribution of the two gases, hydrogen cyanide (red) and formyl cation (yellowish green), shown overlaid on an image of galaxy NGC 1097 taken by the Hubble Space Telescope. One gas is moving towards us (green) and one is moving away (red). By tracking these movements the researchers were able to estimate the central black hole's mass. With just two hours of observational data, they learned enough about the distribution and velocities of the gases to fit them to a model and calculate the pull of the galaxy's core black hole. While astronomers have long been able to measure black hole masses effectively, determining their spins has been much more difficult. Imagine trying to measure the spin rate of something you can't even "see" - a formidable task. Two x-ray space observatories, NASA's NuSTAR and the EPA's XMM-Newton, have teamed up to accurately measure, for the first time, the spin rate of a black hole with a mass two million times that of our sun. The supermassive black hole lies at the heart of a spiral galaxy called NGC 1365 (shown at the left). Einstein's theory predicts that the faster a black hole spins, the closer the accretion disk aligns to the black hole. The closer the accretion disk is, the more gravity from the black hole will warp x-ray light streaming off the disk. 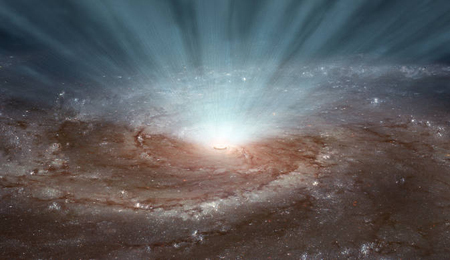 While XMM-Newton determined that X-ray light emitted by iron in the accretion disk was being warped, NuSTAR proved that this distortion was coming from the the black hole and not the gas clouds in the vicinity. Astronomers found that the inner edge of the accretion disk was quite close to the black hole - close enough for gravitational effects to wreak havoc with the X-rays streaming from the disk. This in turn implies a rapidly rotating black hole, since general relativity states that the faster a black hole is spinning, the closer its disk can come to it. The research team, led by Guido Risaliti of the Harvard-Smithsonian Center for Astrophysics and the Italian National Institute for Astrophysics, calculated the rotation rate to be 84 percent of that allowed by general relativity. It is tough to comprehend this figure, since it doesn't translate well into miles per hour. But it's safe to say that the black hole is spinning incredibly fast. The Event Horizon Telescope (EHT) will initially be composed of eight radio observatories based all around the world with the objective of observing up close the black hole at the center of the Milky Way. A prototype of six telescope system has been running for some time. See the image to the left which shows telescopes in Hawaii, California, Arizona, Mexico, Chile and the South Pole. 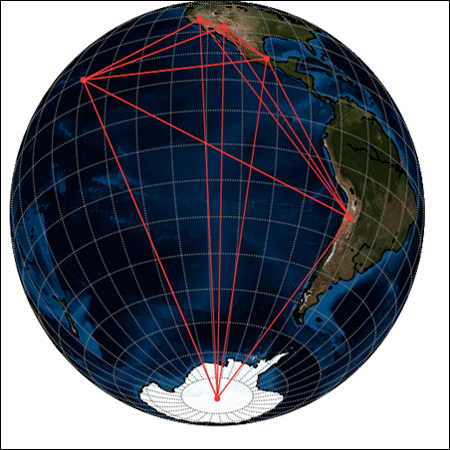 Through the technique of VLBI (explained below) many independent radio antennae separated by thousands of miles can be operated in concert to create a “virtual” telescope with a diameter of almost the size of the planet. As the separation between the telescopes making up the array is increased, the array's resolution increases and it is able to discern finer and finer details. Also, increasing the frequency of the equipment enhances the resolution. Both enhancements are being implemented in 2016. Most people think of black holes as giant vacuum cleaners sucking in everything that gets too close. But the supermassive black holes at the centers of galaxies are more like cosmic engines, converting energy from in-falling matter into intense radiation and jets of x-rays and other radiation are violently expelled into the surrounding area. However, to observe Sgr. A*’s event horizon, one needs an instrument with an extremely tiny resolution. The event horizon of Sgr. A* is estimated to be about 50 micro arc-seconds (μas) in diameter. (An arc-second is 1/3600 of a degree, a measure of angular resolution used by astronomers.) One of the most powerful optical observatories on the planet, the twin Keck telescopes atop Mauna Kea in Hawaii, can only resolve down to 20,000 μas. Trying to see something of 50 μas is like being in Los Angeles and trying to read the date on a coin in New York City. Wow! What Does A Real Black Hole Look Like? Although the Keck telescopes mentioned above have terrific resolutions for optical astronomy, they are far short of the resolution needed for detailed Sgr. A* observation. Hence the need to join many worldwide radio telescopes into one family and attempt to get down to a resolution of about 10 μas. However, getting all the family members in synch using atomic clocks is very tricky and time consuming. Also, processing all the data takes a fair amount of time because each telescope's data has to be tweaked to get all of the telescopes in synch. 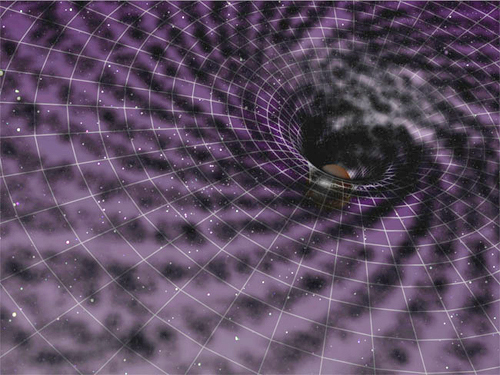 The image to the left is from a simulation of what the black hole might look like to the EHT. It will be somewhat fuzzy due to some distortions from the gas and dust around it. The light surrounding the black hole's shadow will also be distorted by the extreme force of the black hole's gravity. If some of the light is coming towards us, it will be bent by gravity and may cover up some of the black hole's shadow as shown in the simulation. 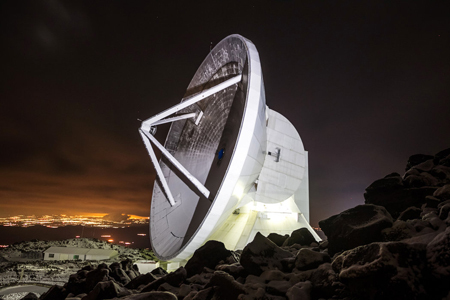 Check out the Large Millimeter Telescope (LMT) to the left, a 20 story facility with a 150 foot bowl shaped antenna on one of the highest southern Mexican mountains and one of the main components of the EHT. It is a joint project consisting of 80% Mexican and 20% American funding by the Instituto Nacional de Astrofísica Óptica y Electrónica (INAOE) and the University of Massachusetts Amherst. Perhaps the most stunning application of the EHT will come when studying the flares Sgr. A* is known to periodically generate. Approximately once a day, multiple observatories have observed a flaring event that not only causes a brightening of Sgr. A*’s emission, but it also changes the structure of the emission region. These flares have been interpreted as “hotspots” in the accretion flow close to the event horizon. When the EHT is fully operational, it will be able to track these hotspots, tracing their origin and watch them diminish. Not only that, astronomers hope to use hotspots as a tracer to map out the "structure of spacetime" in this strong gravity environment. In theory these black hole engines were thought to be powered by magnetic fields. For the first time EHT astronomers, using only three telescopes, have detected magnetic fields just outside the event horizon of the black hole at the center of our Milky Way. In Sgr. A* polarized light is emitted by electrons spiraling around magnetic field lines. As a result, this light directly traces the structure of the magnetic fields. "These magnetic fields have been predicted to exist, but no one has seen them before. Our data puts decades of theoretical work on solid observational ground," adds principal investigator Shep Doeleman, who is assistant director of MIT's Haystack Observatory. 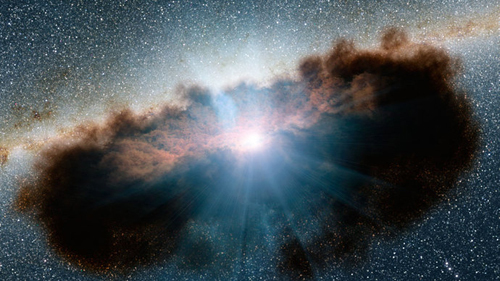 See an artist's conception of the Milky Way Black Hole to the left. 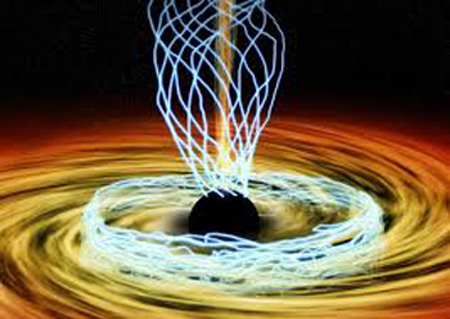 The object in the upper center of the black hole is a corona (never seen by a human, only hard x-rays).The EHT team found that magnetic fields in some regions near the black hole are disorderly, with jumbled loops and whorls resembling intertwined spaghetti. They also found that the some magnetic fields fluctuated on short time scales of only 15 minutes or so. In contrast, other regions showed a much more organized pattern. The results appear in the December 2015 issue of the journal Science. "Understanding these magnetic fields is critical. Nobody has been able to resolve magnetic fields near the event horizon until now," says lead author Michael Johnson of the Harvard-Smithsonian Center for Astrophysics (CfA). "Once again, the galactic center is proving to be a more dynamic place than we might have guessed," says Johnson. "Those magnetic fields are dancing all over the place." As of August, 2015, the current EHT system resolution is about 60 μas. The first images will probably "not" be at 10 μas as multiple refinements have to be implemented to achieve 10 μas. "As soon as the spring of 2016, the complete Event Horizon Telescope is going to produce data from the black hole at the center of the Milky Way," said Avery Broderick, assistant professor of the Department of Physics and Astronomy at the University of Waterloo. "The goal is to directly image the black hole's event horizon for the first time." The Perimeter Institute at the University of Waterloo in Canada will be one of the prime institutions analyzing the data from the EHT. The Event Horizon Telescope is expected to produce data and images of Sgr. A* and M87 (the next closest black hole to earth) well into the early 2020s. Recently NASA's Nuclear Spectroscopic Telescope Array (NuSTAR) captured an extremely rare event in the region immediately surrounding supermassive black hole Markarian (Mrk) 335. The corona, a compact source of x-rays that sits above and close by the black hole, has moved closer to the black hole due to the pull of the black hole's gravity over a period of just a few days. 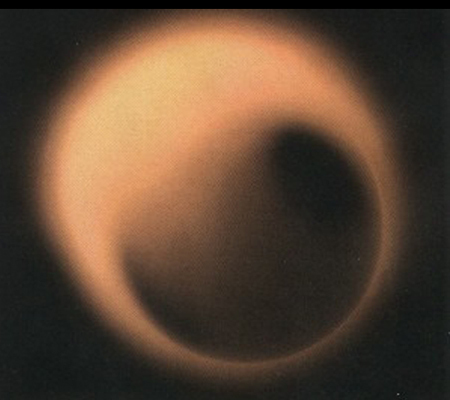 The exact shape and nature of coronas are not known. As the corona shifted closer to the black hole, the gravity of the black hole exerted a stronger tug on the x-rays emitted by it. The result was an extreme blurring and stretching of the x-ray light. Such events had been observed previously but never to this degree and in such detail. The plot of Mrk 335 data to the left, captured by NuSTAR, shows x-ray light streaming from regions near the supermassive black hole. 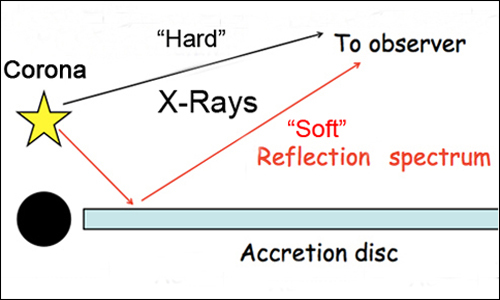 The x-ray light is coming from two areas: the superheated disk of accretion material and a cloud of particles traveling near the speed of light originating from the corona. 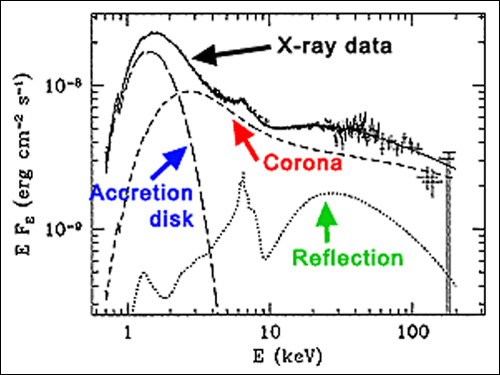 The accretion disk's and corona's x-ray light are mapped over a range of energies. The blue line shows what the plot should look like before the effects of the moved corona. 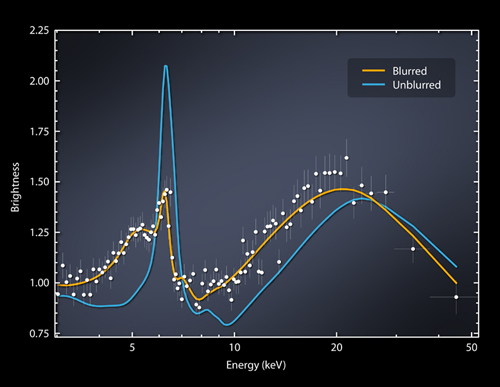 The yellow line shows what the data is predicted to look like if the "corona" x-ray light has been stretched or blurred. 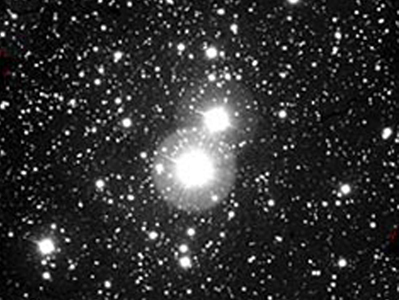 The white dots show the actual NuSTAR data, indicating the light is extremely blurred and as predicted. What's blurring the light? The enormous gravity of the black hole pulls on the x-ray light, making it harder to escape its grasp and in the process the light loses some energy. At the heart of virtually every large galaxy is a supermassive black hole (SMBH) with a mass up to about 18 billion times our sun. 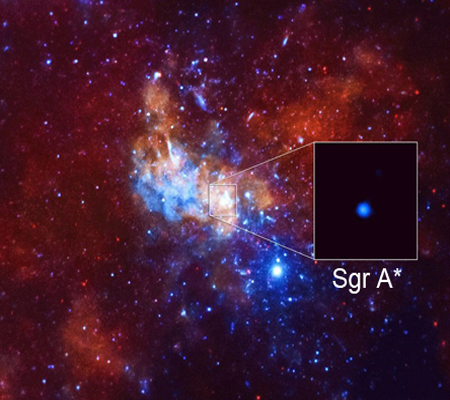 The size of the SMBH appears to have a direct correlation with the size of the galaxy where it coexists. About ten years ago, researchers calculated that the mass of a SMBH had a relationship of 1 to 700 to the mass of its central galaxy bulge. This ratio relationship supports the idea that the evolution of a galaxy is closely tied to the scale of its black hole and vice-versa. See NGC 1433 to the left with its white central black hole. Other studies found another strong correlation. This one is between the mass of a SMBH and the orbital speed of stars in the outer regions of the galaxy. The larger the black hole, the faster the outer stars travel. It is now believed that black holes played a critical role in the evolution of the "universe" even if it is not completely understood at the moment. 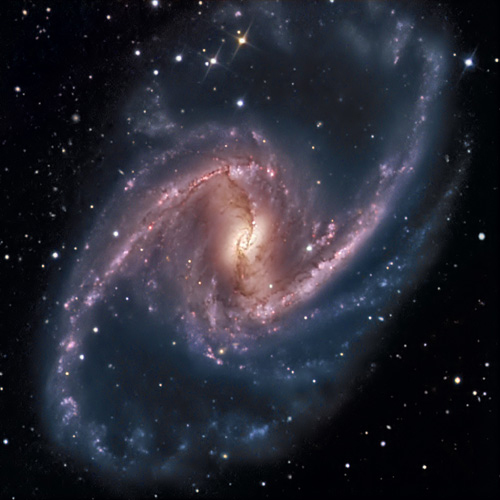 Scientists also believe the evolution of "galaxies" is connected to the growth of supermassive black holes in their centers. During the early quasar phase, a humongous luminosity is released as matter falls into the black hole, and the resultant "radiation driven winds" transfer most of this energy back to the host galaxy. quasar PDS 456 located more than 2 billion light years away, to detect a nearly spherical stream of highly ionized gas streaming out of it. This discovery allowed astronomers to measure, for the first time, the strength of ultra-fast black hole winds and show that they are strong enough to affect their host galaxies. The NASA artist's illustration, to the left, depicts the powerful winds driven by the supermassive black hole quasar PDS 456 (only one side is shown in the artist's impression). "We know that black holes in the centers of galaxies can feed on matter, and this process can produce winds. This is thought to regulate the growth of the galaxies," said Fiona Harrison of Caltech, the principal investigator of NuSTAR and a coauthor of the paper documenting the results in the February, 2015 issue of Science. The data proves that the winds emanate not in a beam, but in a nearly spherical fashion. 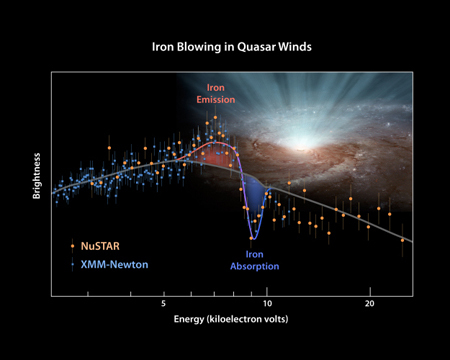 With the shape and extent of the winds determined, the researchers could then calculate the power of the wind and the degree to which the winds could quench the formation of new stars. Steven Hawking - No Event Horizon! Hawking’s proposal is a much more benign “apparent horizon”, which only temporarily holds matter and energy before eventually releasing them, but in a more garbled form. Hawking proposes that Quantum Mechanics and General Relativity remain intact, but black holes simply do not have an event horizon. The key is that quantum effects around the black hole cause spacetime to fluctuate too wildly for a sharp boundary surface to exist. In place of the event horizon, Hawking suggests an apparent horizon, a surface along which radiation attempting to rush away from the black hole’s core will be suspended. Hawking’s theory is that the apparent horizon is the real boundary. “The absence of event horizons mean that there are no "black" holes - in the sense of regimes from which light can't escape” Hawking writes. Hawking invokes an apparent horizon that changes shape according to quantum fluctuations inside the black hole - like a “gray area” for extreme physics. An apparent horizon wouldn’t violate either general relativity or quantum dynamics if the region around the apparent horizon is a tangled, chaotic mess of information. “Thus, information will effectively be lost, although there would be no loss of unitarity,” writes Hawking. This basically means that although the information can escape from the black hole, its chaotic nature ensures it cannot be interpreted, sidestepping the firewall paradox all together. Also, according to Hawking, there could even be no singularity at the core of the black hole. Instead, matter would be only temporarily held behind the apparent horizon, and would gradually move inwards due to the pull of the black hole, but would never quite crunch down to an infinite density point at the center. Since the original article by Steven Hawking was published in January, 2014, several noted astro-physicists have commented on his paper based on the technical detail of a black hole's event horizon. Below are a few key points from a paper by Sabine Hossenfelder, Assistant Professor for High Energy Physics at Nordita in Stockholm, Sweden. "The event horizon is a mathematically well-defined property of space-time, but it’s a mathematical construct entirely. You would have to wait literally till the end of time to find out whether an event horizon really is an event horizon in the sense of this definition." "The apparent horizon is, roughly, something that looks like an event horizon for a finite amount of time. Since all we can ever measure of anything can be done only in finite times it’s the apparent horizon that we ask for, look for, and observe." "That actual event horizons might not be formed when matter collapses, but only apparent event horizons that eventually vanish, is not a new idea. It’s been discussed in the literature for 20 years or so." "What Hawking is saying is that essentially he believes that a matter collapse only leads to a temporary apparent horizon but not to an eternal event horizon. That is an opinion which is shared by many of his colleagues (including me) and there is nothing new about this idea whatsoever." "Hawking’s “paper” is really just a write-up of a talk he gave last year. It’s mostly a summary of his thoughts on the black hole firewall, none of which I found very exciting or remarkable. Had this paper been posted by anybody else, nobody would have paid attention to it." "Stephen Hawking – who died at aged 76 on March 14, 2018 – is remembered in his motorized wheelchair, with head contorted slightly to one side and hands crossed over to work the controls, caught the public imagination as a true symbol of the triumph of mind over matter. (See the photo to the left.) 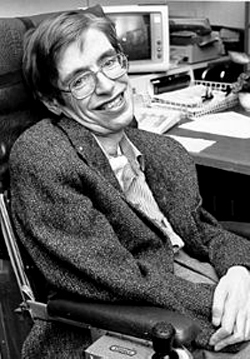 Physical impairment seemed compensated by almost supernatural gifts, which allowed his mind to roam the universe freely, upon occasion enigmatically revealing some of its secrets hidden from an ordinary mortal view" - quoted from Hawking's obituary by Roger Penrose, his famous scientific partner. Between 1965 and 1970 Roger Penrose and Steven Hawking, working together, showed that mathematically there must be a "singularity" of infinite density and and infinite space-time curvature within a black hole. Their big public breakthrough came in 1970, when Hawking and Penrose applied the mathematics of black holes to the universe and showed that a "singularity", an extremely tiny region of infinite curvature in spacetime, was the "beginning point of the Big Bang". While this is pretty common theory today, it was a tremendous scientific breakthrough in 1970. In 1974 Hawking drew on his keen knowledge of quantum theory to declare that black holes emit heat in the form of radiation and eventually go out of existence. This was extremely radical at the time and was not readily accepted by the scientific community. For normal sized black holes, the process is extremely slow, but miniature black holes would release heat at a spectacular rate, eventually exploding with the energy of a million megaton hydrogen bombs. This emitting process is now called "Hawking Radiation". 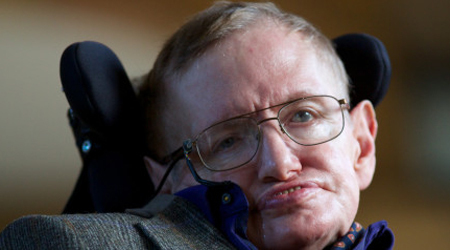 It was the book "A Brief History of Time" that rocketed Steven Hawking to stardom. Published for the first time in 1988, the title made the Guinness Book of Records after it stayed on the Sunday Times best sellers list for an unprecedented 237 weeks. It sold 10 million copies at a $19 list price and was translated into 40 different languages. His life was then played out in biographies, documentaries and also the movie "The Theory of Everything". He appeared on The Simpsons and played poker with Einstein and Newton on Star Trek: The Next Generation. Steven Hawking argued that for humanity to survive it must spread out into space, and has warned everyone about the worst applications of artificial intelligence (including autonomous weapons).